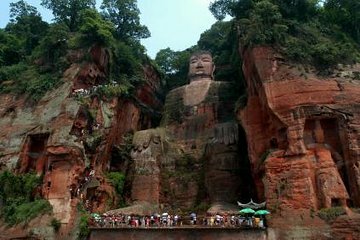 Absorber den mammutiske storheten til verdens største stein Buddha-statue på en privat helgedagstur på Grand Buddha of Leshan fra Chengdu. Ledsaget av en kunnskapsrik guide, beundre den kolossale størrelsen på UNESCOs verdensarvliste, og ta en opplyst reise nedover stier som vever rundt strukturen. Besøk gamle buddhistiske templer og tilfredsstill en appetitt for autentisitet med en smakfull kinesisk lunsj i en lokal restaurant. Nyt bekvemmeligheten til rundturstransport fra Chengdu-hotellet på denne berikende utflukten. Avreise fra Chengdu-hotellet ditt i et privat, luftkondisjonert kjøretøy og nyt naturen som sprawls på 2 timers kjøretur til UNESCOs verdensarvliste. Ved ankomst i Leshan behandler du smakløkene til et autentisk kinesisk måltid i en populær lokal restaurant. Revitalisert, hodet til det hellige tempel av den store Buddha, som ligger bak den kolossale strukturens hode. Forundre den intrikate konstruksjonen av hodehåret, se på 1.020 snoede boller, og følg deretter din guide nedover en vridningsspor mot venstre side av mammutmonumentet. Når du kommer til bunnen, gisp på 233 fot (71 meter) høyde av den største hugget Buddha i hele verden og fange fantastiske fotografier av det hellige stedet. Deretter utforske høyre side av Buddha for å oppdage Wuyou-templet, en rosa-hued bygning som inneholder en overflod av terrakotta skulpturer og kalligrafiske malerier. Se Arhat-hallen, fylt med 500 Arhat-statuer, og absorbere panoramautsikt over tre elver som sammenfaller fint under. Velg å ta et cruise på elva for et alternativt perspektiv på Grand Buddha (egen regning) og kom tilbake til ditt komfortable kjøretøy for den avslappende turen tilbake til Chengdu-hotellet. Martin is great! And he is very knowledgeable about each sight we have visited . I highly recommend him to anyone and wish him the best in this business. A reall professional! It's a long ride from Chengdu, but it is absolutely amazing! This tour was great! The guide (Mars) was very informative and helpful. She was also really personable--it felt like I was hanging out with a friend. The driver was extremely professional as well. Highly recommended! Amazing journey. 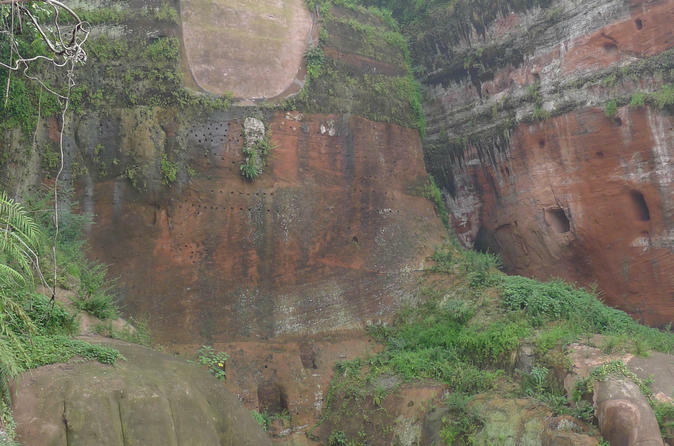 The Leshan Giant Buddha is absolutely stunning. One of the most amazing thing I've ever seen. Our guide, Audrey, was extremely charming and professional, giving us great information about this gigantic piece of art. Some other reviews suggest that the boat is the best way to see the Buddha but I have to say that nothing can compare with the close-up experience of climbing down and then up the steps alongside the statue. It is good to get there as early as possible and also to avoid peak season. We were able to proceed straight to the steps. Local lunch was enjoyable and chopsticks are not so difficult to use! For me the two-hour journey from the city was also most interesting as it gave an overview of the villages, countryside and agriculture, all such a contrast to the city itself. It was just as much part of the experience and not simply a means to get there. The guide, as with all Viator guides that I have met, was most informative. Actual tour as per expectation at time of booking. Firstly our guide 'Coral' was excellent, very friendly, spoke good English and the driver was first class especially with the traffic and 'non existent rules of the road it would appear'. The journey to Lesham takes about 2 hours and Coral gave us an excellent commentary during this journey. Unfortunately the weather was dreadful, luckily had umbrella with us. On arrival the crowds were everywhere, good job did not arrive in height of season. Throughout the visit to the Buddha, Coral gave a good history and explanation and we had a laugh. The wait to walk down the Buddha and up again was around 2 hours so we declined due to the weather conditions but Coral made up for this with her commentary. The lunch was superb. One observation perhaps to improve this visit is to climb up and be given the commentary and visit the temples then proceed to the 'boat option' rather than waiting up to 2 hours to fully view the statue then followed by the lunch, that way everybody would see everything. The return journey to the hotel took again another 2 hours so a very full day.